Awake fibreoptic intubation (AFOI) is the gold standard of management of the predicted difficult airway. Sedation is frequently used to make the process more tolerable to patients. It is not always easy to strike a balance between patient comfort and good intubating conditions on the one hand and maintaining ventilation and a patent airway on the other. In the last 30 years, many drugs and drug combinations have been described, but there is very little in the literature to help guide the practitioner to choose between them. The objective of this article is to discuss the evidence supporting the use of the agents described with regard to their efficacy, recommended doses and techniques, and limitations to their use for AFOI. Publication databases were searched for articles published from 1996 to 2012 relating to sedation for AFOI. Benzodiazepines, propofol, opioids, alpha2-adrenoceptor agonists, and ketamine are the main classes of drugs that have been described to facilitate AFOI. Drugs that are most suitable have a combination of both anxiolytic and analgesic properties. The ideal choice of drug may vary depending on the patient and the indication for AFOI. There is good evidence to support the use of two drugs in particular, remifentanil and dexmedetomidine. Each has certain unique characteristics that make them an attractive choice for an AFOI. Kevin Johnston was responsible for the conception of the review. Kevin Johnston and Mridula Rai contributed substantially to the design of the article and the acquisition of data, and they were involved in the critical revision of the article. L’intubation fibroscopique vigile (AFOI pour l’acronyme anglais) constitue l’étalon or de la prise en charge de voies aériennes anticipées comme étant difficiles. La sédation est fréquemment utilisée pour rendre le processus plus tolérable pour les patients. Il n’est pas toujours facile de trouver un bon équilibre entre le confort du patient et de bonnes conditions d’une part, et le maintien de la ventilation et de la perméabilité des voies aériennes d’autre part. Au cours des 30 dernières années, de nombreux médicaments et combinaisons de médicaments ont été décrits, mais la littérature ne contient que très peu d’exemples pour guider le praticien dans le choix du bon médicament ou de la bonne combinaison médicamenteuse. L’objectif de cet article est de présenter les données probantes appuyant l’utilisation des agents décrits en ce qui touche à leur efficacité, aux doses et techniques recommandées, et aux limites de leur utilisation lors d’intubation fibroscopique vigile. Nous avons mené une recherche dans les bases de données de publication afin d’extraire les articles publiés entre 1996 et 2012 concernant la sédation pour l’AFOI. Les benzodiazépines, le propofol, les opioïdes, les agonistes des adrénocepteurs alpha-2 et la kétamine sont les principales classes de médicaments qui ont été décrites pour faciliter l’AFOI. Les médicaments les plus adaptés à cet usage possèdent une combinaison de propriétés anxiolytiques et analgésiques. Le médicament de choix peut varier selon le patient et l’indication pour l’AFOI. Des données probantes convaincantes appuient l’utilisation de deux médicaments en particulier, le rémifentanil et la dexmédétomidine. Chacun de ces médicaments possède certaines caractéristiques spécifiques qui le rendent intéressant pour réaliser une AFOI. Awake fibreoptic intubation (AFOI) is the gold standard of management of patients with an anticipated difficult airway. It can be an unpleasant experience even with careful and meticulous application of local anesthetic. Conscious sedation is desirable not only to make the procedure more tolerable for patients but also to ensure optimal intubating conditions, particularly in the presence of abnormal laryngeal anatomy and pathology. Deep sedation can result in loss of airway with serious consequences. A major challenge during AFOI is to provide adequate sedation while maintaining a patent airway and ensuring spontaneous ventilation. The ideal sedative for AFOI would provide anxiolysis and a degree of amnesia with a low incidence of recall of the procedure. It would have analgesic properties, suppress the cough and gag reflex, and be safe and easy to titrate with minimal respiratory and cardiovascular side effects. In the last three decades, the use of several classes of drugs have been described, from benzodiazepines (e.g., diazepam and midazolam), to opioids (e.g., morphine, fentanyl, and more recently remifentanil), to alpha2 agonists (e.g., clonidine and dexmedetomidine), and to intravenous induction agents (e.g., ketamine and propofol). The purpose of this article is to review the evidence supporting the use of currently available drugs with specific reference to their efficacy, safety profile, drug dosages, and limitations when used for an AFOI. A search was made of PubMed-MEDLINE, Google Scholar, EMBASE, the Cochrane Library, and the Web sites of seven peer-reviewed anesthetic journals (1996-May 2012) using the terms: “fibreoptic intubation”, “awake fibreoptic”, “awake intubation”, “conscious sedation”, “remifentanil”, “fentanyl”, “sufentanil”, “morphine”, “midazolam”, “propofol”, “ketamine”, “dexmedetomidine”, and “clonidine”. The full texts of articles identified from potentially relevant titles and abstracts were reviewed. Both authors independently screened the retrieved reports and excluded irrelevant data. A manual inspection was subsequently performed through the reference lists of all studies, and foreign language articles with an English language abstract were included. We included all randomized controlled trials (RCTs), clinical trials, and case reports comparing or describing drugs for sedation for AFOI. We excluded studies that described conscious sedation for bronchoscopy and other awake intubation techniques using devices such as the intubating laryngeal mask or video laryngoscopes. Most studies use a combination of two and occasionally even three drugs to achieve a desired state of conscious sedation. In these cases, there is usually a primary drug, and other drugs are used in conjunction to achieve a desired state. We classified the data according to the primary drug that was the focus of the clinical trial or the case reports. The strength of the available evidence was assessed according to the Scottish Intercollegiate Guidelines Network (Table 1) and summarized in Tables 2 and 3. We identified four drug types that have been used primarily for conscious sedation for AFOI, i.e., benzodiazepines, propofol, opioids, and alpha2 agonists. Following a discussion of the wider issues relating to the conduct and safety of sedation for AFOI in general, the evidence supporting the use of the most popular drugs and their respective combinations for this purpose is discussed. Remifentanil TCI provides optimal conditions for AFOI. Addition of ketamine to TCI remifentanil did not offer any advantages. High incidence of cough (60%), agitation, and inadequate sedation in the ketamine only group. Drugs used for conscious sedation during AFOI generally fall into two categories. There are those that, by virtue of their anxiolytic properties, are used to supplement the psychological management of the patient. Though a good rapport with a well-prepared patient may help, it is not enough in most cases. Other drugs are used for their analgesic properties as adjuncts to local anesthesia (LA) and contribute to the control of respiratory and hemodynamic responses to airway instrumentation. Though evidence is lacking and preferences tend to follow trends with time, some techniques of local anesthetic topicalization may be more effective and less demanding on pharmacological analgesia than others. Indeed, the quality of topicalization also draws significantly on operator experience as well as on the anatomical and physiological state of any particular patient and the urgency of the situation. The use of anxiolytic and analgesic properties in combination is the key to rational “sedation” for AFOI, although the relative requirements for each vary with the circumstances. For example, the conditions required for safe tracheal intubation of a patient in respiratory distress with an oropharyngeal mass are likely to be very different from those required for the management of a patient with a cervical spine injury in whom coughing and straining should be avoided. Individual drugs may have anxiolytic or analgesic properties or both. Unfortunately, many (but not all) anxiolytic drugs have hypnotic properties that tend to predispose to further loss of airway patency, while opioid analgesics cause respiratory suppression. It has thus often been stated that “sedation” should not be used to facilitate AFOI in patients at risk of airway obstruction or respiratory failure, although the emergence of newer therapies may challenge this view. Topicalization per se can be difficult and dangerous in severely anxious patients with impending airway obstruction. With these concerns in mind, measures are needed to optimize the safety of the procedure regardless of choice of drug. Appropriate levels of “sedation” for safe AFOI are difficult to standardize, not least because the required combination of anxiolysis and analgesia varies widely from case to case. Moreover, the clinical end points of optimal “sedation” using opioids cannot really be compared with the end points of “sedation” using drugs that are primarily hypnotic. Sedation scores and the use of depth-of-anesthesia monitoring (bispectral index, entropy) may be rational in the future, but, to date, they have been largely confined to trials. On the other hand, basic monitoring modalities (pulse oximetry, electrocardiogram, and noninvasive blood pressure) should be seen as mandatory. In a later case series, Ovassapian used smaller doses of diazepam (0.07 mg·kg−1) and slightly more fentanyl (1.7 μg·kg−1). One hundred twenty-nine patients who were at high risk of aspiration for various reasons were sedated until they were “lightly asleep if unstimulated, but still responsive to command and able to carry out instructions”. None aspirated and there were no instances of airway obstruction, but two patients required “verbal encouragement to breathe”.3 Despite the impressive size of these case series, it is impossible to comment on the safety of this combination of drugs in any one individual or even groups of similar individuals Nevertheless, the overall data seem to suggest it was a safe technique, albeit obviously in expert hands. It is also worth mentioning that these series date from a time when pulse oximetry may not have been universally used. Indeed, data on oxygen saturation during AFOI is not provided in the above work. Midazolam subsequently supplanted diazepam as the benzodiazepine of choice in combination with fentanyl. Sidhu et al. administered intravenous midazolam (1-3 mg during endoscopy and 1-5 mg during tracheal tube railroading) to 58 patients needing AFOI for C-spine surgery who were premedicated with intramuscular morphine.4 Topicalization was with “spray-as-you-go” (SAYGO) LA, and by definition, the patients would have had otherwise normal airway anatomy and no respiratory distress. The mean time to intubation was 16 min. Fourteen percent of patients desaturated to <90%, yet moderate to severe coughing occurred in 20%, and in one patient, tracheal intubation necessitated general anesthesia. These observations would suggest that the use of high doses of midazolam may not be able to compensate for inadequate analgesia or topicalization and may be associated with respiratory compromise. It is difficult to arrive at any conclusion on the use of benzodiazepines for AFOI based on the small number of studies available. The advantage of the technique lies in its simplicity and the wide availability and long-standing experience with use of both classes of drugs; however, the apparent disadvantage is that use of intermittent boluses of drugs can be associated with overshoot and the risk of oversedation. 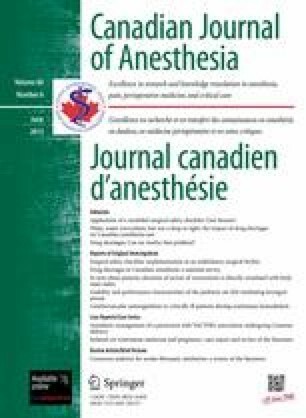 A greater body of published work has focused on target-controlled infusion (TCI) of propofol for AFOI, either as the sole agent or in combination with remifentanil.10-13 Target-controlled infusions of propofol for AFOI have been assessed in three RCTs providing level 1 evidence comparing it with remifentanil (Table 2)10-12 and in one RCT comparing it with dexmedetomidine.13 In the propofol arm of the randomized trial by Rai et al., the tracheas of 9/10 patients were successfully intubated at the first attempt after SAYGO topicalization. Severe coughing in one patient did necessitate a second attempt.10 The mean (range) propofol TCI in their study was 1.3 (1-1.6) μg·mL−1, which is lower than the effect-site concentrations reported in other studies. This may be due to the authors using 1-2 mg of midazolam in conjunction with TCI propofol to achieve the desired levels of sedation. The study reported better intubating conditions and patient tolerance in the remifentanil group, although the patient recall of the procedure was lower in the propofol group. In another study, Tsai et al. intubated the tracheas of 19/20 patients at an average final propofol effect-site concentration of 3.6 μg·mL−1. Spray-as-you-go topicalization was used in all their patients who had oral cancer and presumably irregular airway anatomy. Increasing the propofol to 5.0 μg·mL−1 in one patient (because of movement) resulted in desaturation to 80%. None recalled the tracheal intubation, but they were uncooperative at the end, and immediate progression to general anesthesia was necessary in every instance.13 Airway obstruction was more frequent with propofol than with dexmedetomidine, as was the increase in heart rate in response to tracheal intubation. An even higher average (standard deviation) propofol concentration of 3.9 (1.4) μg·mL−1 was used by Lallo et al. who successfully intubated the tracheas of 29/30 similarly topicalized patients. One case was abandoned for reasons similar to those reported by Tsai et al., yet moderate to severe coughing was still reported in 30% of patients, and patients in the propofol group were significantly more sedated and less cooperative than those in the remifentanil group.11 Zhang et al. compared the suitability of propofol and remifentanil as single agents for sedation for AFOI without the use of premedication or topicalization of the larynx with local anesthetic.12 Whereas intubation was possible at remifentanil effect-site concentrations little more than those required for objective signs of sedation, an average concentration of propofol of 5.8 (1.5) μg·mL−1 was necessary for passage of the tracheal tube through the vocal cords under these conditions. Fifteen of the 17 patients lost response to prodding and shaking, and severe respiratory depression occurred in one. The authors concluded that propofol is unsuitable for sedation if laryngeal topicalization is not used. More recently, case reports have described the concurrent use of propofol TCI with remifentanil TCI for AFOI14-16 Authors describing the combined use of TCI propofol and remifentanil for AFOI have reported mean effect-site concentrations during the procedure of 0.8-2.0 μg·mL−1 and 1.5-3.2 ng·mL−1, respectively. Although there is no evidence supporting the superiority of TCI propofol over a fixed rate infusion in the setting of an AFOI, it is safe to say that a TCI has a more consistent pharmacodynamic effect and may allow for a more predictable level of sedation to be maintained. Awake fibreoptic intubation can be associated with intense nociceptive stimulation, especially during passage of the tracheal tube through the nose and the larynx. While pure sedatives provide anxiolysis and amnesia and may help to smooth the process, they cannot substitute for inadequate airway topicalization with local anesthetic. Opioids are strong analgesics with some hypnotic effect and can help attenuate the coughing and hemodynamic changes resulting from airway instrumentation. Indeed, on occasions such as in the presence of mucosal inflammation, difficult anatomy, or excessive secretions, local anesthetic alone may be inadequate to eliminate the airway responses to instrumentation. Remifentanil is a potent and ultra-short-acting opioid with a context-sensitive half-time of three minutes and an elimination half-time of six minutes. Its unique pharmacokinetic characteristics make it easy to titrate, while it provides profound analgesia, suppresses airway reflexes, and has minimal effect on cognitive function.20-24 This makes it an attractive drug of choice for the intensely stimulating but usually brief airway manipulation during an AFOI. It is increasingly being used either as the primary agent or in conjunction with midazolam10,11,25 and, more recently, propofol14-16 to provide sedation during AFOI. Studies evaluating remifentanil as a primary agent have described its use at different set rates of infusion, by bolus dose followed by infusion, and, more recently as a TCI. Reusche and Egan provided one of the earliest descriptions in 1999. They used an infusion of 0.175 μg·kg−1·min−1 (combined with midazolam 2 mg and droperidol 0.625 mg) in a patient with Ludwig’s angina.26 The authors described suspending the remifentanil at a predicted effect-site concentration of 4 ng·mL−1 when the patient appeared “too sedated”, although they didn’t expand on the circumstances which led to this intervention. Their patient had no memory of the procedure, which not being characteristic of remifentanil, suggests that the effects of the other drugs were significant and may have largely contributed to the oversedation. With these concerns in mind, Puchner et al. described the use of remifentanil at a rate of 0.07 μg·kg−1·min−1 with no additional sedative drug to achieve AFOI in a morbidly obese patient with respiratory failure.27 Other than respiratory depression, which responded to commands to breathe, no airway loss was reported per se. The authors went on to randomize a further 74 patients requiring nasal intubation for elective maxillofacial surgery to undergo an AFOI with either a relatively high dose of remifentanil (0.25-0.5 μg·kg−1· min−1, as required) or boluses of fentanyl and midazolam.28 Hemodynamic changes were lower and tolerance of the procedure was higher in the remifentanil group. Unsurprisingly, respiratory depression was very common, but even at these doses, was always corrected by verbal commands to breathe. Machata et al. did not report the length of time taken for tracheal intubation in their patients; therefore, little can be said about the likely effect-site concentrations of remifentanil being compared in their study. Simple dosage regimens based only on patient weight do not result in stable effect-site concentrations because of the complex pharmacokinetics of drugs such as propofol and remifentanil. Manual administration is therefore more likely to be associated with overshoot, interpatient variability, and accumulation. Also, patient tolerance during fibreoptic intubation using these regimens is highly dependent on the delay between the onset of the infusion and the beginning of the procedure, and it also varies with the duration of fibreoptic intubation. There is evidence to suggest that remifentanil sedation administered via TCI provides better conditions and is associated with a lower incidence of complications, such as apnea and respiratory depression, compared with manual administration.30-32 By using TCI, stable effect-site concentrations can be obtained rapidly and maintained for as long as desired, since these devices deliver intravenous drugs using a computer-controlled algorithm that takes into account the drug’s particular pharmacokinetic properties. Target-controlled infusion allows the user to achieve a chosen predicted concentration rapidly and with minimal overshoot. As the principle agent for sedation, TCI remifentanil has thus far been compared with TCI propofol for AFOI in three well-designed RCTs. Rai et al. randomized 24 patients requiring AFOI for elective surgery to TCI remifentanil or propofol, both titrated initially to a modified Steward sedation score. Tracheal intubation with a mean effect-site concentration of remifentanil of 3.2 (2.8-3.5) ng·mL−1 was faster, rated easier by the operator, and better tolerated by patients than tracheal intubation with a mean effect-site concentration of propofol of 1.3 (1-1.6) μg·mL−1.10 The authors attributed the improved conditions in the remifentanil group to the antitussive and analgesic properties of remifentanil, which resulted in reduced coughing and tracheal tube tolerance during intubation. Lallo et al. randomized 60 patients to either TCI remifentanil or TCI propofol, both of which were titrated to the patients’ comfort during the procedure and not to a sedation score.11 Intubating conditions were found to be satisfactory in both groups; however, all patients receiving remifentanil (mean effect-site concentration 2.4 ng·mL−1) were able to open their eyes and breathe on command if saturations fell, which was not the case with those receiving propofol (mean effect-site concentration 3.9 μg·mL−1). The only procedure abandoned secondary to loss of the airway was in the propofol group. Patients in the propofol group were more sedated and, not surprisingly, had a lower incidence of recall compared with those in the remifentanil group. The authors commented that the opioid would therefore be their choice of agent in situations where manual ventilation might be difficult. More recently, Zhang et al. have reported that an effect-site concentration of remifentanil 3.74 (0.31) ng·mL−1 was sufficient to allow AFOI without either premedication or laryngeal topicalization.12 All their patients responded to commands to breathe and sustained saturations >90%. Recall was 100% with remifentanil compared with 41% with propofol, but 15 of the 17 patients in the latter group became unresponsive, and three patients desaturated to <90%. Three studies have looked at the use of remifentanil required for AFOI in the absence of any other sedatives and without application of local anesthetic to the larynx.12,35,36 Under these conditions, Vennila et al. found that the mean effect-site concentrations of remifentanil required for fibreoptic endoscopy and railroading of the tracheal tube were 6.3 ng·mL−1 and 8.06 ng·mL−1, respectively. Despite the very high concentrations of remifentanil used in their study, it is interesting to point out that mild coughing during tracheal intubation was still found in 15 of the 20 patients, and 13 patients reported mild to moderate discomfort.35 There were no reported incidences of adverse events, specifically, desaturation to <90%, although the authors did not report the respiratory rates during the procedure. In stark comparison, Zhang et al. found that a mean effect-site concentration of remifentanil of only 3.74 (±0.31) ng·mL−1 was all that was necessary for AFOI without laryngeal topicalization. All their patients reported the procedure to be “acceptable”; however, the incidence of coughing and quantification of discomfort were not reported.12 Vennila et al. went on to suggest that a limitation of their study was that their patient population were all of young age (mean age 34) with few comorbidities (American Society of Anesthesiologists grade I-II). Mingo et al. had previously described the use of remifentanil by simple infusion for AFOI in 24 patients, similarly with topical anesthesia limited to the nasal mucosa.36 In their study, the dose ranged from 0.2-0.5 μg·kg−1·min−1, and the mean time from starting remifentanil to intubation was 12.5 min, suggesting that the effect-site concentration range would likely have exceeded those of Zhang et al.12 and (at the highest rates) those of Vennila et al.35 In three of the 24 patients, the respiratory rate fell to <8 breaths·min−1 and the lowest rate recorded was 2 breaths·min−1. The patient population in their study was older (mean age 58) and mainly American Society of Anesthesiologists categories II and III. Level 1 evidence for the efficacy and safety of dexmedetomidine for AFOI is provided by five RCTs. Tsai et al. randomized 40 patients needing AFOI to either dexmedetomidine (1.0 μg·kg−1) or propofol TCI (effect-site concentration 3.6 μg·mL−1) (see above and Table 2). Both drugs provided satisfactory intubating conditions; however, patients in the dexmedetomidine (DEX) group had less discomfort, heart rate changes, and episodes of airway obstruction13. Hagberg et al. randomized 30 patients with “expected difficult airways” to either a dexmedetomidine bolus of 0.4 μg·kg−1 followed by an infusion at a rate of 0.7 μg·kg−1·hr−1 or a remifentanil bolus 0.75 μg·kg−1 followed by an infusion at a rate of 0.075 μg·kg−1·min−1.29 There were no differences in recall or hemodynamic stability between the two groups; however, the DEX group required more attempts at intubation (first attempt success rates 38% in the dexmedetomidine and 76% in the remifentanil group), while mean oxygen saturation levels were lower in the remifentanil group. Interestingly, the sedation scores were lower in the DEX group, which may suggest that the smaller initial bolus of dexmedetomidine used in this study may have lacked efficacy in comparison with the doses used in other studies. This may be a contributing factor to the higher number of attempts at intubation in the DEX group. It is interesting to point out that the authors chose to compare DEX with midazolam only sedation, which is commonly used in combination with an opioid for AFOI. Consequently, it is not surprising that patients in the midazolam only group in both RCTs had hypertension and tachycardia and were less cooperative and not as satisfied with the experience. In cases of critical airway obstruction, avoidance of drugs that depress both conscious level and ventilatory drive, as alluded to above, is recommended. While no one would argue that this recommendation applies to any agent that acts by modulating the GABAA receptor, there is little evidence that sedation with an agent that depresses ventilation but not level of consciousness (remifentanil) or vice versa (dexmedetomidine) is more dangerous than conducting AFOI with LA alone. Topical anesthesia in patients with critical airway obstruction can be difficult to achieve,62 and though a rarity, inadequate anesthesia of the larynx or even the application of topical anesthesia itself can precipitate total airway obstruction63-65 Although there has been a recent description of the use of dexmedetomidine with no use of LA at all,57 there is generally more evidence supporting the safe use of remifentanil in this fashion, at least in the context of patients without critical airway obstruction. The last decade has seen the practice of conscious sedation revolutionized, not only by the introduction of drugs with unique pharmacokinetic properties, such as propofol, remifentanil, and dexmedetomidine, but also by the introduction of target-controlled drug infusion systems that allow for easy titration and maintenance of steady state drug levels. The relative advantages and disadvantages of three commonly used drugs, propofol, remifentanil, and dexmedetomidine, are summarized in Table 4. There is sufficient level 1 evidence in the form of well-designed RCTs to support the statement that propofol is not very effective as a primary sedative agent for AFOI. Propofol used alone or in combination with midazolam is associated with more coughing when compared with remifentanil and dexmedetomidine, and this can translate into poor intubating conditions. Evidence suggests an increased risk of oversedation and subsequent airway obstruction associated with the use of propofol when compared with remifentanil and dexmedetomidine. The main advantage of propofol seems to be a low incidence of recall, and it is this property that makes it an attractive adjunct to drugs such as remifentanil. Although, most of the studies have used propofol as a TCI, there is lack of evidence to suggest that it is superior to a fixed-rate infusion. Furthermore, there is no consensus on the ideal dose range for propofol use in AFOI. It is clear, however, that use of high doses of propofol to improve intubating conditions is associated with an increasing incidence of oversedation and airway obstruction. The two drugs that stand out in terms of increasing popularity and growing evidence to support their use are remifentanil, an ultra-short-acting noncumulative opioid, and dexmedetomidine, a highly selective α2-agonist. While each drug has certain unique pharmacological properties that make it attractive for use as conscious sedation for AFOI, it is interesting to point out that the same properties may also result in the drawbacks associated with their use. Several well-designed RCTs support the use of remifentanil for AFOI, especially as a TCI. Remifentanil was found to provide better intubating conditions when compared with propofol in three well-designed RCTs. Despite its use being associated with a high incidence of recall, it is well tolerated by patients, which is indicated by the high patient satisfaction scores reported in most studies. The incidence of recall can be decreased by concomitant use of midazolam and /or propofol; however, their addition can potentiate the other disadvantage associated with remifentanil, i.e., respiratory depression, which is generally seen as a dose-related decrease in respiratory rate and minute ventilation. The question that needs to be asked is whether recall of events in itself is a disadvantage, particularly if the patient does not perceive the recalled procedure as unpleasant. Data suggest that most patients are not unduly distressed by recall of events; however, this may be an issue in a patient who is extremely anxious and desires a degree of amnesia. There is consensus on the dose range required for TCI remifentanil; an effect-site concentration in the range of 3-5 ng·mL−1 will produce the desired conditions when used in conjunction with midazolam 1-2 mg or when combined with a small effect-site concentration of propofol (<1.0 μg·mL−1). The use of higher doses of remifentanil (5-8 ng·mL−1) with a view to avoid combination therapy and minimize the topical application of local anesthetic can be associated with hypoxia and respiratory depression, and this technique is unlikely to be applicable to the wider population. It is the authors’ practice to use TCI remifentanil at a starting concentration of 3 ng·mL−1 and TCI propofol at 0.5-0.8 μg·mL−1 for AFOI. Once the plasma and effect-site concentrations have achieved equilibrium, the decision to titrate remifentanil and/or propofol will depend on the patient. In a majority of patients, TCI propofol at 0.8 μg·mL−1 provides a reasonable degree of amnesia, and remifentanil is titrated up to 3-5 ng·mL−1 to achieve the desired level of sedation. In anxious patients where recall may be perceived as unpleasant, remifentanil may be set to 3 ng·mL−1, while the propofol is titrated to 1.0-1.5 μg·mL−1 as required. This latter approach may also be required when dealing with chronic pain patients on high doses of opioid in whom remifentanil, even at concentrations of 7-8 ng·mL−1, may be ineffective and propofol is the more desirable drug. It is also our practice to ensure meticulous application of LA despite the more forgiving nature of modern sedatives. This skill may be of great use when faced with the need to perform an AFOI in a patient with airway obstruction. The other drug that is gaining popularity is dexmedetomidine, as it creates a state of “cooperative sedation” from which the patient is easily rousable, while its antisialagogue effect contributes to good conditions for AFOI. Level 1 evidence supports its use on the basis of good intubating conditions, its tolerance by patients, and its high reported patient satisfaction scores. Nevertheless, there is lack of current evidence to suggest that it is superior to either propofol or remifentanil as sedation for AFOI, since a degree of bias must be implicit in all of the RCTs involving dexmedetomidine to date. There is good evidence to suggest that a 0.7-1.0 μg·kg−1 bolus over ten minutes followed by a 0.3-0.7 μg·kg−1·hr−1 infusion will create the conditions required for AFOI with minimal side effects. The large number of case reports and case series certainly support the premise that dexmedetomidine is a promising drug with little effect on respiration and side effects (such as hypotension and bradycardia) which are occasional and can be treated. The use of sedation in patients with impending airway obstruction is a controversial issue. Avoidance of drugs that depress conscious level and ventilatory drive is usually recommended; however, application of topical anesthesia has been reported to precipitate complete airway obstruction.63,65 Theoretically, remifentanil should not affect a patient’s level of consciousness or airway patency and may be of benefit in patients where extreme anxiety or distress with resultant tachypnea and tachycardia may compound the problem. Nevertheless, hypoventilation associated with its use can compromise the airway, especially in this clinical setting, and low doses of remifentanil would be used only with extreme caution in these circumstances. There are no case reports or series to support the use of remifentanil in this context, which is not surprising given the rarity of these clinical situations and the declining popularity of the “case report”. There is some evidence in case reports to support the use of dexmedetomidine in this situation. At present, no recommendations can be made, and a clinician will need to use individual experience and judgement on a case by case basis. It is important to realize that anesthesiologists experienced in AFOI may achieve good results with any of the abovementioned drugs; however, there is a lack of data to suggest which drug is more suitable in the hands of those who seldom perform an AFOI. One of the main limitations of this review is the paucity of level 1 evidence in the form of well-designed randomized controlled studies. We identified 14 RCTs over a period extending more than 30 years. Most of the available evidence is in the form of observational studies and case series or isolated case reports. This is probably a reflection of the fact that RCTs are difficult to conduct given the difficulties involved in recruiting from a small and highly select patient population and the need for anesthesiologists who are experienced in performing this procedure. There is a definite need for a large well-designed multicentre trial that may finally provide the much needed data.